As Democrats have avoided providing funding for walls or barriers as part of President Donald Trump’s priority effort to secure the southern border, some Republicans who support the construction of a border wall have sought out alternative means to obtain the necessary funding. Republican Texas Sen. Ted Cruz actually devised a rather ingenious plan last year that would utilize the forfeited and seized assets of Mexican drug cartel leaders to help pay for improved border security measures, especially barriers, fencing and walls, where necessary. Business Insider reported that Cruz reminded everyone on Twitter of his plan on Tuesday following the guilty verdicts issued in the trial of former Sinaloa Cartel kingpin Joaquin “El Chapo” Guzman, which would utilize the estimated $14 billion in assets owned by Guzman to pay for a border wall, should prosecutors be successful in seizing those funds. That tweet included a link to a story from The Associated Press detailing the several charges that Guzman had been convicted of, which included a number of drug trafficking and conspiracy-related charges that will result in his spending the remainder of his life behind bars in a U.S. maximum-security prison. 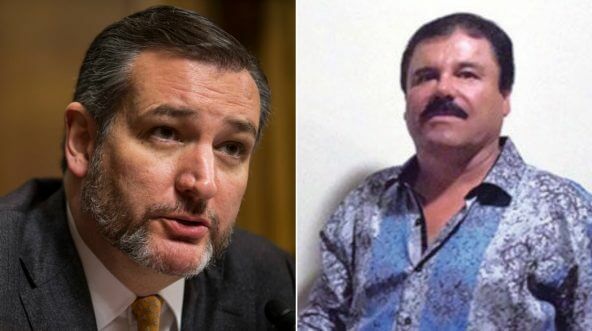 Do you support Sen. Cruz’s “El Chapo Act”? That tweet included a link to Cruz’s Senate page where he discussed the reintroduction of his bill titled “Ensuring Lawful Collection of Hidden Assets to Provide Order” — the EL CHAPO Act — which would reserve any assets and funds seized from Guzman or other convicted drug lords for explicit use for border security. The senator further noted that prosecutors were seeking the criminal forfeiture of all proceeds and profits derived from Guzman’s illicit drug trafficking empire, which has been estimated at upwards of $14 billion. It remains to be seen if prosecutors will be successful in seizing and liquidating all or any of those assets, meaning the actual amount forfeited could be substantially less than $14 billion. There is little doubt that Democrats opposed to the construction of any sort of barriers on the border will attempt to block or derail this effort by Cruz, either during the legislative process or in the courts, should the bill be passed and signed into law. Regardless, this is an excellent idea put forward by Cruz. Hopefully, his fellow Republicans, and even some Democrats, will vote in favor of the bill, which Trump will most likely sign to fulfill his oft-mocked vow to make Mexico pay for the wall in a roundabout way.